Suzanne Alund would dearly like to follow the ground rules suggested by Northeastern University administrators at orientation for parents of incoming freshmen. The 49-year-old from Albany, N.Y., has committed them to memory: Do not call a student, let her call you; do not e-mail in lieu of calling; do not call the university president when a roommate situation flares. But eyeing her daughter as the two sat side by side during an orientation break, Alund said her motherly instincts guide otherwise. ''How well I am going to stick to the plan, I don't know; it's a big hole in here," she said, patting her heart. ''I know I'm going to be tempted to IM her." 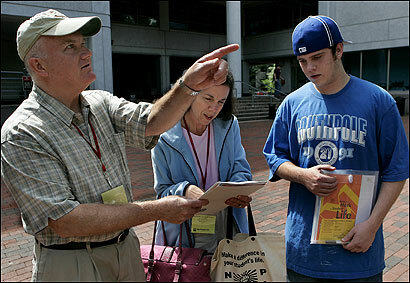 Parents have long suffered the pangs of separation when a child ventures out of the nest and onto a college campus. But college and university administrators say that parental overinvolvement, from overcalling a student to overcontacting administrators, has become a pressing issue. Schools have even adopted measures to keep parents from intervening unnecessarily. At the University of Vermont, students serve as ''parent bouncers" during orientation to keep parents from wandering into sessions specified for students. Parents leave campus with magnets bearing messages that they ought to ask their child before calling a dean, such as ''What do you think you need to do to work this out?" and ''Who have you talked to on campus about this?" At Boston University, staff trained to handle parents' calls follow guidelines that encourage parents to permit students to handle routine affairs. ''We have found ourselves more often raising the question: Where is the student in this conversation, literally?" said Denise Mooney, director of the University Service Center. Meanwhile, dozens of schools now incorporate sessions on handling separation into orientation, often employing unsparing lectures on the perils of overparenting. At Northeastern, the seminar is dubbed ''A Time of Holding On and a Time of Letting Go," with an emphasis on the letting go. In an age of instant communication, administrators said the psychological break between parent and child during college has become a far trickier dance, one further complicated by a generation of parents that administrators say are stunningly loath to let go. Theories abound to explain the growing ranks of what administrators call ''helicopter parents" who hover over their offspring. Hypotheses range from the competitive frenzy over school success to the high cost of college education and the trend toward smaller families, in which children make decisions with their parents. Schools said they have been forced to try to impede some parents' intervention on behalf of the students' well-being. The overparenting, they say, endangers a crucial development phase in which students are seeking to become self-reliant. At the University of New Hampshire, the director of residential life, Scott Chesney, wrote in an online letter to parents: ''I hope you see that at one level we embrace the notion of partnering with you to make your son's or daughter's experience as productive as possible. Frankly, however, we worry sometimes that your interventions may well be impeding your son's or daughter's climb toward independence." Scholarship on the effects of overparenting is beginning to emerge. This year at Middlebury College, Barbara Hofer -- an associate professor of educational, developmental, and cultural psychology -- will conduct a study of parental involvement in the college years, focusing on the role played by technology. ''Some parents who ride herd through high school might think they can continue to do it through college with cellphones and e-mail," Hofer said. ''Perhaps technology allows behaviors to be sustained that would have been harder to sustain before." Other researchers are examining the effect on parents of overinvolvement. Missa Murry Eaton, an assistant professor of psychology at Pennsylvania State University in Sharon, coauthored a study that found that parents overly focused on children's success were prone to emotional dips. ''Parents whose self-worth is contingent on a student's performance were much more likely to feel symptoms of anxiety and depression, less likely to be satisfied with life," Eaton said. Administrators say they began to notice the uptick in parents' calls and oversight five to seven years ago. Many attribute the shift to e-mail and other easy forms of communication. But others say technology only exacerbated a phenomenon already underway, prompted in part by family dynamics. Smaller families, of which there is a growing number, tend to foster unusually close relationships between parents and children. When both parents work, administrators say, they may harbor a sense of guilt over time missed with children, prompting overcompensation. Others say parents perceive a greater sense of fragility, born of rearing children in a post-9/11 atmosphere and following the Tylenol poisoning scare in the 1980s. Still others say the growing cost of college fosters a sense of entitlement. ''There is a feeling of being an active consumer and wanting to make sure that they are getting their money's worth," said Karen Levin Coburn, assistant vice chancellor for students at Washington University in St. Louis and coauthor of ''Letting Go: A Parents' Guide to Understanding the College Years." Dani Comey, associate director of student life at the University of Vermont, said a parent, in preparation for dorm room decoration, called her this week to inquire about the dimensions of each piece of furniture the university provides. ''I reminded the parent that the student wasn't in a single and that it was important that the student be in touch with the other student," Comey said. Rodger Summers, vice president for student affairs at Binghamton University, said he talked a father out of making a three-hour trip to bring a mother's home-cooked meals to a student each week. ''I told him, 'No guy is every going to ever want to date his daughter because he'll have to compete with you!' " Summers said. Most surprising, administrators say, is the extent to which students seem not to mind the intrusion. ''I haven't seen any signs of objections from students," said Mooney, pointing out that students at BU who grew up with highly-involved parents are familiar with the pattern. At Northeastern's orientation, Sarah Clark, 18, of Norfolk, nodded in agreement when her mother reminded her that she had to have her photograph taken for her ID. It was item number 10 on the checklist the university mailed weeks earlier; her mother had taken care of items one through nine. Clark, who plans to major in communications, said she was delighted her mother had tended to the details. Still, she said, she is setting limits. ''My mother wants us to talk everyday, but I say maybe twice a week," she said. Jim and Susan Badavas of New Jersey said they assumed before orientation that they would talk daily with their son, Matthew. Now they are prepared for a once-a-week phone call, per Northeastern administrators' advice. ''The key is to give our son the space he needs and not overwhelm him," Jim Badavas said. Susan Badavas nodded. ''I'm going to try it," she said. But at the mention of her son alone on campus in two weeks, Badavas scrunched her face in displeasure and scanned the crowd of students, searching for Matthew.